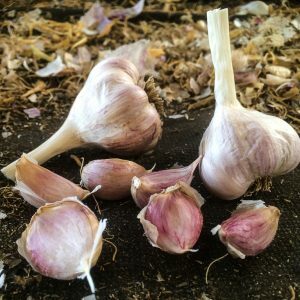 For those of us in temperate or cold climate regions, we can now grow garlic in our greenhouses and have two crops per year, and with their long storing potential, have garlic all year round. 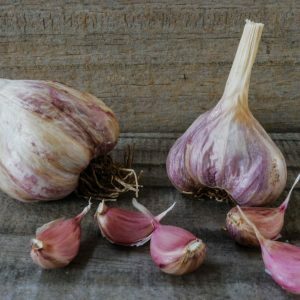 Subtropical garlics grown in Northern NSW and QLD have shown great potential in growing in greenhouses in our temperate and cold climate regions. Their daylight neutral bulbing characteristic and love of warm temperatures make them perfect for the greenhouse. 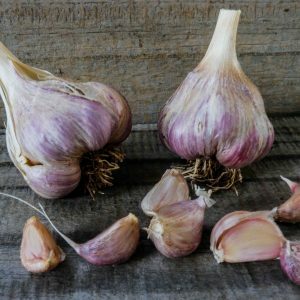 Being in a cold climate – I keep my Crop 2 seed in the fridge for 4 weeks to give it just a little chill before planting it again. Cloves Number: 12-15 cloves in between 2 to 3 layers. Outer cloves being rounded wedge shape and inner cloves are long and thin. Colours vary from pink to pale purples. Bulbils: 1-2 in Pseudostem – first immediately either within or above bulb and the second further up the pseudostem. Growing: Continually develops leaves with little dormancy during warmer winters, as long as plant has sufficient size and growth before winter. Can vary from squat to tall plant with large separations in stem between leaf sets. Can develop between 10-12 leaves with strong upright growth characteristic. Harvest: At least 4-8 weeks before Turbans. When bulb is maturing, the stem will weaken whilst leaves are still green and bends over till completely flat on ground. 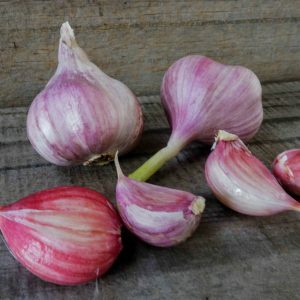 Leave till leaves start to lose colour before harvesting at full bulb maturity.